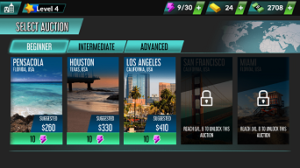 Bid Wars Is A New Strategy Based Offline Android Game In Which Your Goal Is To Get Rich And Build An Empire. You Visit Many Places – Bid On Auction, Collect Items, And Earn Profit. It’s An Addictive Game. Here We Cover Basic Of The Game – How To Play, And Some Tips And Tricks For Bid Wars: Pawn Empire Game. 1.) You Start The Game With A Tutorial In Which You Just Tap, Tap, And Clear Initial Level. Basic – You Own A Pawn Shop Where You Sell Items Which Your Purchase At Auctions. Auctions – Auctions’ Category Divided Into Three Modes-Beginner, Intermediate, And Advanced. Each Category Includes Auction’s Place Like Pensacola, Houston, Los Angles, And More. To Unlock Auction Or Take Part In Auction You Have To Spend Some Bucks. Each Auction Costs You Energy[Energy Automatically Restores After Few Minutes, But If It Is Less Than Minimum Then You Can Not Bid On Auction]. Enter Into Auction – You Have 5 Seconds Of Time To Know The Value Of Items[Exclude-Boxes]. After It, Auction Starts – The Player Who Pay Highest Bid For A Set Of Items Will Get The Whole Unit. After All, Units Sold, Total Value Of All Items Revealed. For Instance, You Purchase A Whole Set/Unit For $300, And Total Value Revealed $400 Then Your Score Will Be $100. Sell Collected Items – It’s Time To Sell. You Can Sell Instantly For Less For Example – You Purchase A Unit/Set Of Items For $300 And Actual Value Is $400 Then You Will Earn $100. 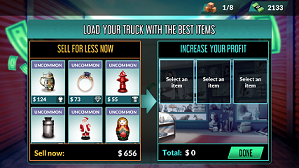 Sell At Pawn Shop – If You Want To Sell Items At Pawn Shop[You Should Sell At Pawn Shop] Because You Know You Will Get Higher Value There And Profit Will Be High Then Select High Valued Items And Load To Truck. Go To Main Screen Of The Game And Enter Into Your Pawn Shop. 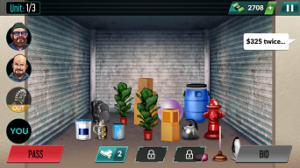 There You Have To Place Items. Wait For Few Minutes To Get Great Offer. Upgrade – You Can Upgrade Truck To Load More Items, Inventory, And Shelves. Shelves – Initially You Have Only 1. As You Clear Levels You Unlock More. How To Level Up – To Unlock Next Levels, You Have To Complete Simple Objectives. Go To Main Screen – Tap On Mobile Button. There You Will See Objectives To Clear Like Sell Any Item On Pawn Shop, Play In Houston Two Times Etc. Boot – This Feature Lets You Kick Out Others From Auction. Calculator – This Feature Tells You Estimated Worth Of A Unit. 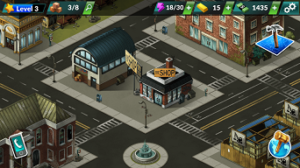 Tips – To Earn More Profit, You Should Sell Collected Items At Your Pawn Shop. Don’t Purchase All Units. Use Those 5 Seconds Properly To Know The Value Of Items. Upgrade Your Truck, Shelves, And Inventory. Complete Objectives For Level Up. Size – 80MB/Varies[Approx.]. Price – Free[Contains Ads, In-App Purchase]. Download – Here[Google Play Store].